Generate a report of all open invoices due by a given date. 1. Report By: Allows you to select whether to run the report based on your invoice’s Due Dates or their Invoice Date. 3. Please select the latest due date to include: Is where you enter the latest due date or invoice date that you want to run the report on. 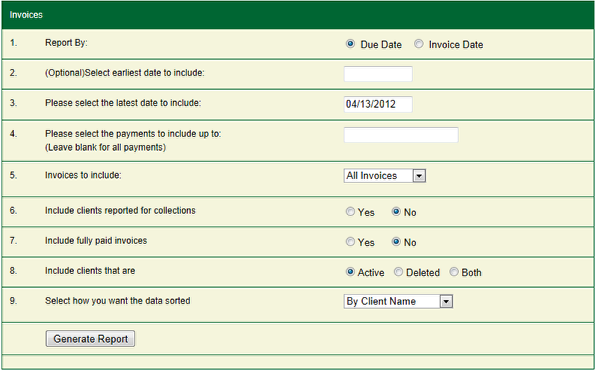 This will show you all open invoices where the due date or invoice date is on or before the date you entered. The report will not list any open invoices where the due date/invoice date is after the entered date. 4. Please select the payments to include up to, (Leave blank for all payments): Will only take in account a payment made against an invoice if the payment date is before the date you entered in that field. Leaving this field blank will take into account all payments made against an invoice. 5. Invoices to include: Select whether you want to show all invoices, invoices with auto pay turned on, or invoices with auto pay turned off. 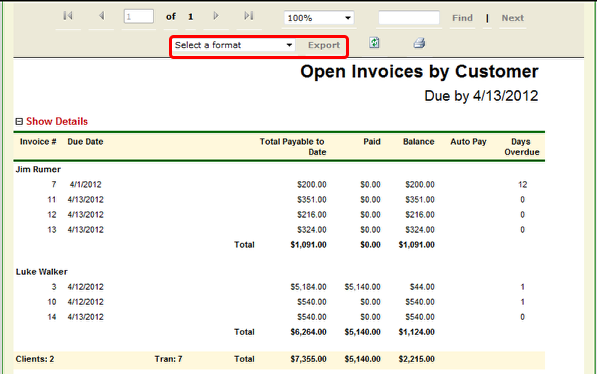 Select All Invoices to show all open invoices, select Auto Pay Only to show all open invoices with auto pay enabled, select Non-Auto Pay to show all open invoices with auto pay disabled. If an auto pay invoice tries to run and fails, the Account Receivable report will show you the error message it received when trying to charge the customer’s credit card. 6. Include clients reported for collections: Will list invoices assigned to a customer that you have already reported to collections. See also Collections Report. 8. Include clients that are: Allows you to select to include invoices that belong to deleted clients, active clients, or both. 9. Select how you want the data sorted: Allows you to choose By Client Name, By Invoice Balance, or By Invoice Due Date.